On Thursday March 8 2018 we broke from usual programming to celebrate the amazing women within the Melbourne music community. As well as 24 hours of special programming, from 5 until 7pm, PBS brought four live acts to the station and the airwaves for a celebration of epic proportions. Music lovers were welcomed to PBS HQ to catch the performances live. Members receiving a free beer from our mates at Mountain Goat Beer. PBS' special guests were Girls Rock Melbourne participants, who are sure to be leading the charge for the next generation of Melbourne musicians. Fang It! 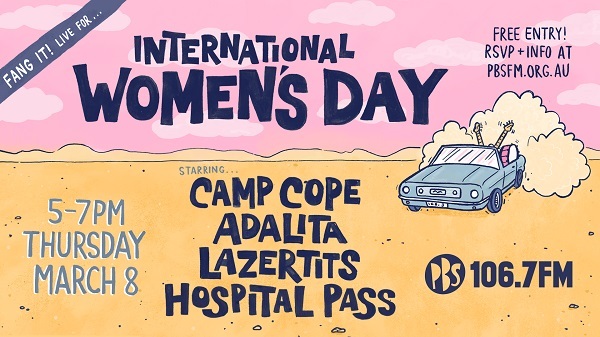 live for International Women’s Day was also heard on stations around Australia through the Community Radio Network, and Frankie Magazine continued the celebration with an exclusive video premier of Camp Cope’s live performance.